Here's a small review of the Valencia week for me. It's been a couple days and I'm still going through a lot in my head. Lots of things are coming to light, and while there are still some uncertainties, one thing is for sure - my time here in MotoGP is not going to come to an end any time soon! I've always noticed the skies in Valencia, and perhaps because of its proximity to the ocean, it varies quite a bit and is usually beautiful. 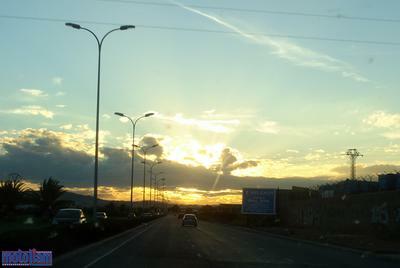 I flew into Valencia from Barcelona on Tuesday afternoon/evening, and heading from the airport to the Bonaire Ibis hotel, I caught a gorgeous sunset. Click on the photo to be taken to the rest of this post. I settled into the hotel, tense and excited about the upcoming weekend. 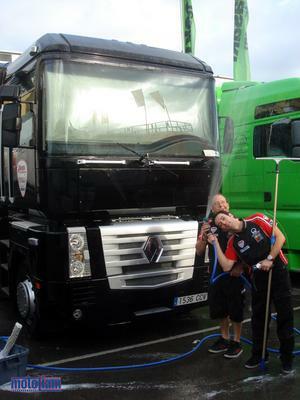 Wednesday morning brought cool temperatures and Tomas and I, along with Pachi (Antonio), had some fun washing both our team semi-trucks. Climbing around on the trailer tops afforded us a nice view of the rapidly expanding paddock, as the hospitalities were busily being assembled. Another nice touch was that I actually had some high-quality wax (from Japan) so I could really put the shine on the girls. Nicky Hayden seemed to be in good spirits and ready to fight after the Danigate debacle in Estoril. As they say, "that's racing!". It was very interesting to see how public opinion has been swayed by the way everyone involved handled themselves in the press following the incident. Most notable (and the reason why I took this picture) are the two Spanish kids wearing the American flag. True, they were wearing Spanish flags around their waists, but up top, it was all red, white, and blue! 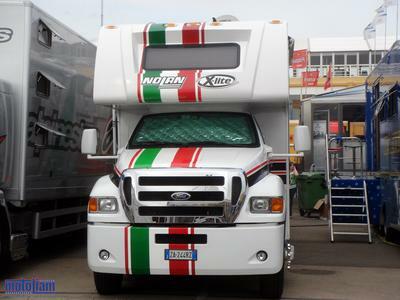 As much as there was some American support, in general, the paddock felt that the day would belong to the Italian. I would say there were more American fans at this race than any other foreign GP I have been to, and hopefully this is a trend that will continue. 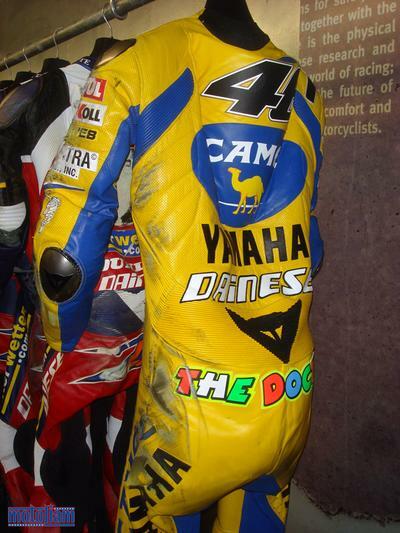 I have long preached that American fans, of whatever rider or brand (who cares?!) should get off their sofas and get onto some planes to check out how they do it in Europe. 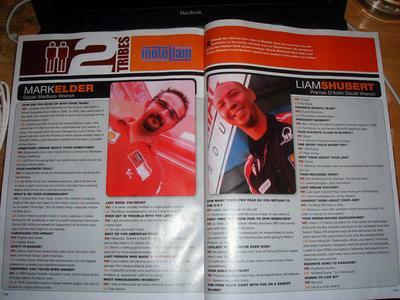 That night I was invited out to dinner with a couple of the Ducati Factory guys, because Mark Elder and I were celebrating our little mini-interview in Road Racer X Magazine. 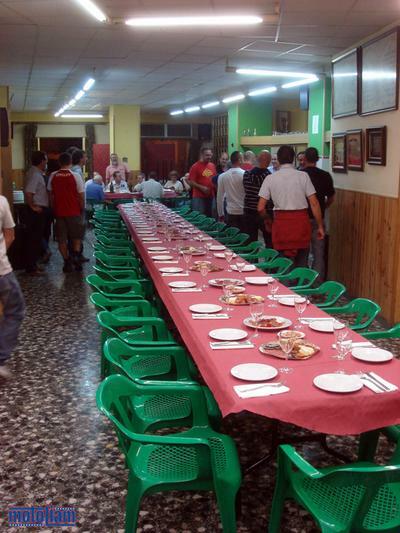 The food was at a little place deep in Valencia, and was prepared by some pure Ducatisti's. It was awesome, but I'll let the pictures do the talking for me. Ahhhhh, meat and cheese! 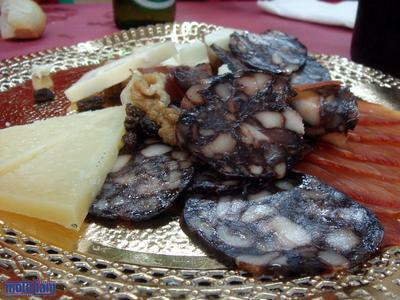 The Morcilla (blood sausage) was great! 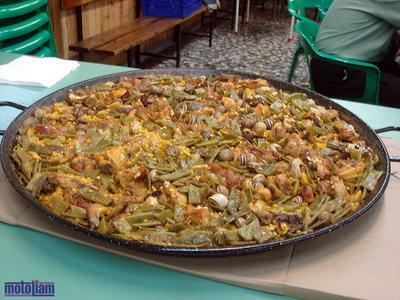 But it doesn't get any better than Valencian Paella! The standard pan seems about three feet wide, and it was fantastic. This was my first time seeing snails in paella, and they complemented everything nicely. Also ran into "Racerboy" from Barf. He and a few friends made it out to the race and were having the time of their lives. See? Travelling to the Euro-rounds is worth it! 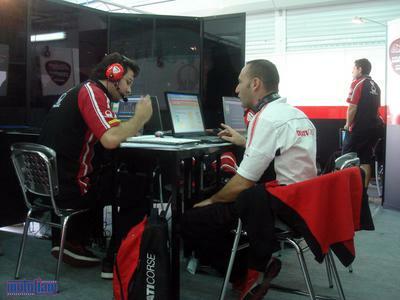 Back in the garage on Thursday, we began putting our skulls to work getting ready for the last race of 2006. The man in white will be Casey Stoner's chief mechanic next year, but this year, he's doing his best to help us go faster with what we've got. 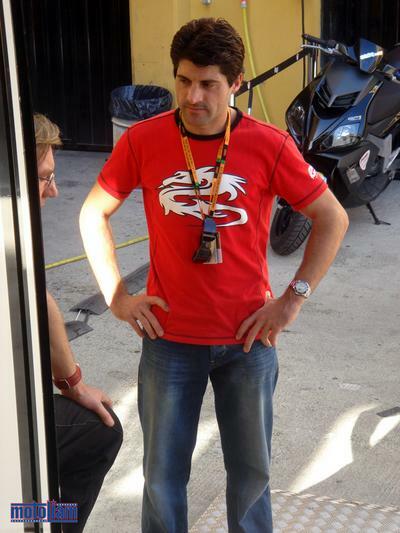 It bodes very well for the Pramac D'antin Ducati team that Ducati Corse are getting more and more involved. Alex Barros was visiting with us in preparation for his first outing on the bike the next week, and here he is talking with his future chief mechanic and two other engineers. Just as Troy Bayliss proved to everyone that he is as fast, if not faster, than ever, we're hoping that Barros is able to make the same transition to the GP7 800cc Ducati next year. There were also tons of riders walking around, from many different series. 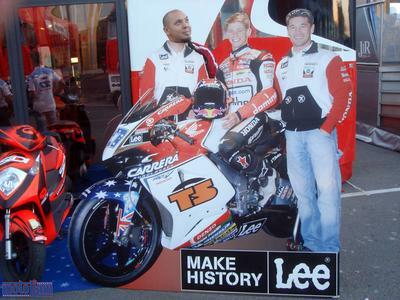 I spoke with Shakey, McWilliams, Schwantz, you name it. It seemed like everyone was here for this historic race. Who's this? Hmmmm, this could be an interesting place to work. 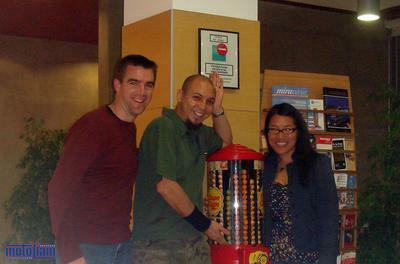 One evening I caught up with some other fellow Barfers, Higgy B and his girl, Ming, the merciful. Great couple, and they remind me of how things should be between a man and a woman. By this time, Saturday, I'd developed a serious eye infection, most likely from having a piece of debris get stuck under my contact lense and ruining my day. I'm not quite certain, as I also managed to get some fuel in there, too. Anyway, things move around pretty quick when you're standing behind a 990cc powerhouse with the bump starter and it's impossible to be perfectly "safe" in this kind of environment. I went to the Clinica Mobile for some eye-drops and just to check in with them in case it was more serious than I thought. It's been four days now, so I think it's pretty bad. A few more days and I'll probably end up getting it really checked out in Barcelona. 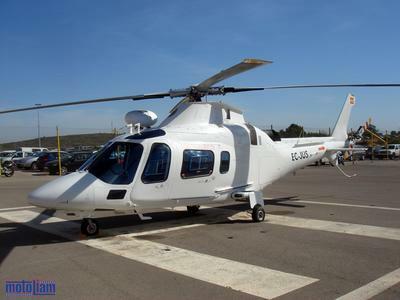 Found this cool chopper behind the facilities. It was pretty tough to bull through the eye problems (massive sensitivity to light and constant watering and pain), but this was the race of the season, and I wanted my rider to do his best. The hills were at max capacity, with extremely hot weather and tons of sunshine. 130,000 people showed up on Sunday - that's like, what, double what Laguna brings?!? The race was shocking, dramatic, and I enjoyed it more than any other this year. Our box was crowded with VIP guests, and everyone was riveted to the monitors as the action unfolded. History was being made. 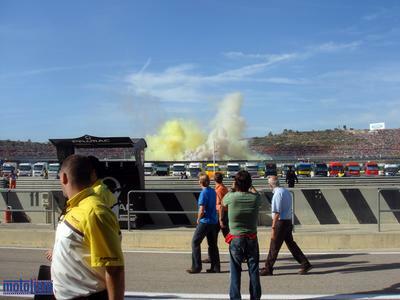 Immediately after the race, fireworks started going off. What could have been? I think Valetino lost this year because Hayden put together the best combination of skill, consistency, teamwork, and luck. 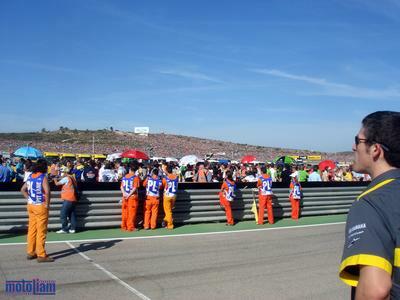 I'm positive that Yamaha and Michelin are busier than ever getting ready for next season. . . . just like everyone else! I wasn't sure if this was going to be my last race or not, and I wanted to wish the tire guys well. Tomas and I spent a few minutes saying thank you for the year, and everyone confirmed that we're all good. Good on you, guys, I'd rate you. Then it was time to say hello to next year's people. I can't wait to see how next season goes, with the new tire regulations in place. That's all the time I have right now, but I'll be back to post some more photos from this past race, and eventually I'll get around to posting more photos and experiences from the fly-away races and anything else I may have missed. Feel free to email with and questions or comments. It was great seeing you to man! 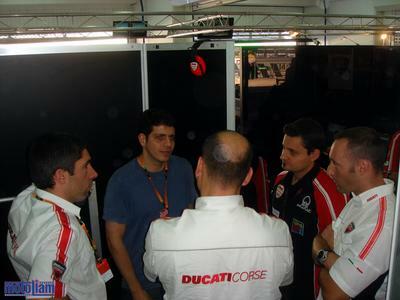 It sounds like your Ducati experience is just beginning, best of luck. Hey Liam........Just a quick note. 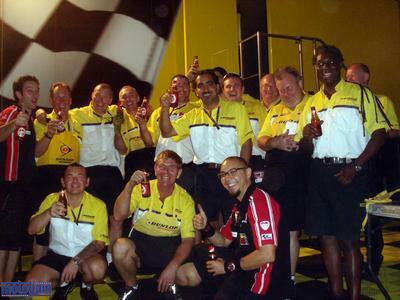 As MotoGP Fanatic, I want to thank you. 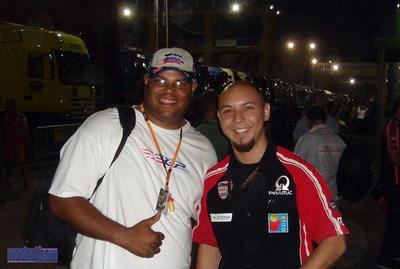 Your personal story is cool, fanstastic........but to bring US your view into the world of MotoGP and EVERYTHING that it touches and vice versa is extra special. MotoLiam is going to be at the top of my MotoFav websites along with Colin's website, and Nicky's. If....and when you hit the shores of the USA, and are back in San Francisco, I'd like to hook up and buy you a brewsky or two at the Zeitgeist! Look me up. You've got my website on file, I'm easy to find. Your site is so cool. Now is the time to survive the off season.